Nemo received a lot of attention. Its user interface was heavily modified and its behavior was adapted to integrate better with Cinnamon.You can now easily hide the sidebar and switch back and forth between places and treeview. Under each place, if applicable, a small bar indicates how much space is used. Cinnamon now features its own screensaver. You can also set your "away message" before locking the screen. All configuration modules are now present in Cinnamon Settings. You no longer need to use Gnome Control Center. Cinnamon now supports desktop widgets called desklets, similar to plasmoids on KDE desktop. However this is still under development and there are not many desklets available yet. As the development continues we hope to see more desklets coming up. In Cinnamon 1.8 you can install spices (i.e. applets, desklets, themes, extensions) straight from your desktop. 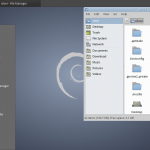 Cinnamon is available in the debian testing contrib repository. Now copy the lines again and paste at the end of the file and change wheezy to testing. What the above piece of text does is called pinning. It basically tells apt to give the stable branch higher preference over the testing branch. Which means that a package will be installed from testing only if it is not available in stable. This is necessary, otherwise all packages will be upgraded to testing branch un-necessarily. Now finally update the apt cache. It will install a lot of gnome libraries if they are not already available. This is because it is based on gnome 3. So now the cinnamon desktop is setup. Simply logout and select Cinnamon desktop on the login screen and you should get into cinnamon finally. 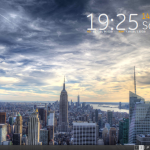 The cinnamon desktop can also be installed using the linux mint repositories. Add the following repository to your /etc/apt/sources.list file. Package libgjs0b is not available, but is referred to by another package.